"Alone with You" Reviewed by RadioIndy.com! 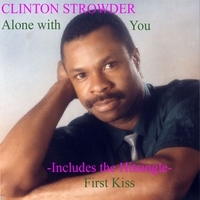 "Alone with You" by Clinton Strowder is an impressive high energy pop album by a very talented singer. The well polished production quality makes the tracks crisply pump out of your speakers. The album opens with the catchy ballad "Biography" where Clinton sings to the heavens. "Dream to be" is a great pop tune reminiscent of 80s pop stars such as Lionel Richie. The track features a great funk guitar scratch technique, which would put even "Superfly" himself to shame. The standout track is the album’s first single "First kiss" which is about that special first kiss between two passionate lovers. The track also features more funk elements with heavy slap bass to flow with the soulful melody. One of our favorite tracks is "Stay With Me" which features all the makings for a hit - group vocals, hand claps and a catchy beat to go along with the catchy chorus. Overall this is a great pop album which also features elements of soul, funk and even jazz. Be sure to check this one out, especially if you’re a fan of soulful pop artists such as Lionel Richie, Boys to Men and even Michael Jackson.